Please select an option X-small Small Medium Large X-large Please select a size. Happy Saint Patrick's Day everyone! Are you looking for a funny St Paddy's day shirts? Our youth graphic baseball shirts are made of breathable lightweight ring spun cotton that can ensure comfort and also that are easy to wash and dry. Our raglan shirts are pre-washed shirts preventing any significant shrinking after the first wash. All our designs are created, printed and shipped from California USA, and we offer hundreds of unique, cute, and funny designs for various themes and special occasions providing perfect and easy gift options not only for your kids but also for your nieces, nephews, and friends at any time and for any special occasion. 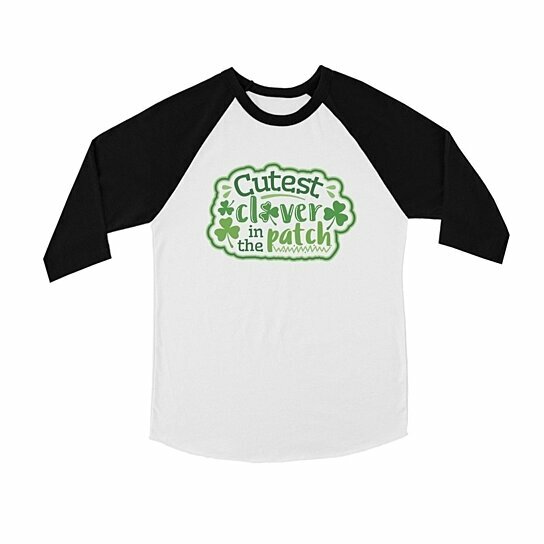 Order our "Cutest Clover In The Patch" shirt today for you son and daughter!